/ What is Glamping? An Introduction to Luxury Camping. Do you want to experience the joys of staying in the outdoors, but aren’t so keen on the idea of traditional camping? Then maybe Glamping is the solution for you. If you’re wondering what is Glamping, it’s “Glamorous Camping”- in other words it’s just like camping, but in a tent that has many of the amenities that you’d expect in a hotel room. The difference, of course, is that unlike a hotel room you will be able to open your door and look straight out across the countryside or, if you’re Glamping at a music festival, look out at the unwashed people who aren’t living in such luxury! ​Compared to the camping definition, which is when you sleep in the outdoors in a tent with very few features other than a sleeping bag and a bottle of water, the Glamping definition is one that sounds more like a well furnished hotel room. Of course this depends on the holiday you choose to go on, but the basic idea is that you are being at one with nature, without sacrificing the conveniences that you have come to expect from modern life. Beyond purely being a luxurious way to camp, Glamping is a term that’s now used to describe unusual types of accommodation in the wilderness. The difference between a glamping structure and a hotel is that, in theory at least, it is a free standing structure that can be packed away- unlike the long lasting nature of a hotel building. The most common place that you will see people glamping is at music festivals, where the option to upgrade from the traditional camping experience has proven to be a popular option for many attendees. It’s not just limited to these events though, as there are a number of glam camping sites that you can visit all year round. What Amenities can you Expect While Glamping? Of course, the things on offer at each glampsite depend on the type of accommodation, price you are willing to pay, and the environmental conditions in the area (for example a glampsite somewhere that’s cold will offer heaters, and those in hot climates will have air-con units). 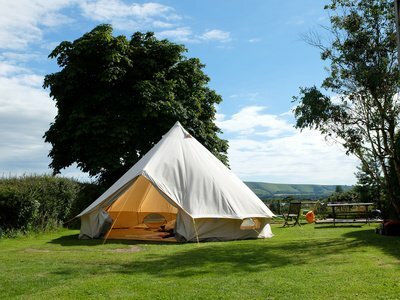 If you want to experience living outdoors, whether on a campsite or at a music festival, but you're Not Quite Wild, and don’t really like the idea of staying in a basic tent, then Glamping is a great choice for you. What is glamping best for? Simply put, it’s luxurious outdoor living where you’ll have all the amenities you would expect from a hotel, but with the added benefit of being able to walk out the door, take a deep breath of fresh air, and look out across nature!